You can create engagements and clients in bulk for a specific tax year. 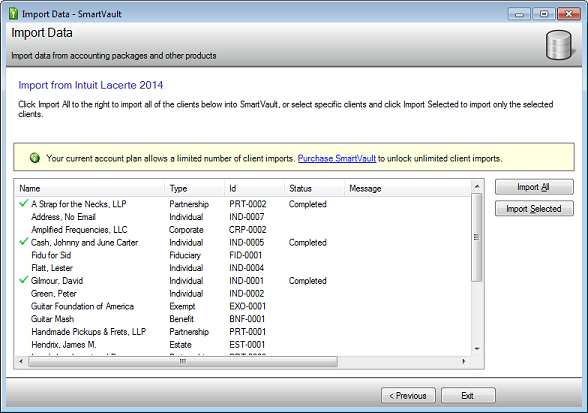 If you have more than a dozen new clients from Lacerte or ProSeries to import into SmartVault, it may be easier to use the SmartVault Data Import Tool instead of doing them one at a time. 1. From the Connected Desktop, click File > Import data. 2. Select the year that you want to import for and make sure your SmartVault account is highlighted. 4. 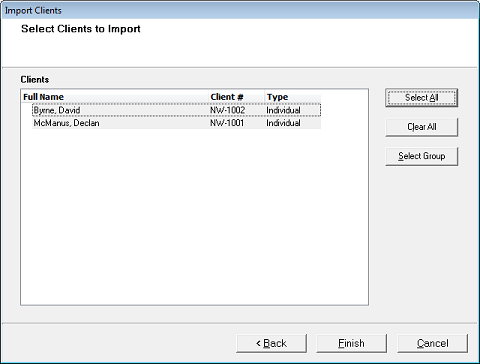 If using Lacerte, select the client types you want to import. Click Select All to import all clients. If you only want to select some, press CTRL and click the clients you want to import. Note: ProSeries users can skip this step. 6. Click Import All to confirm the import. 7. Click Exit when finished.